In my last post in this series, I explained that the kind of individualism we see among American Christians was prefigured in first-century Corinth. Like us, the Corinthians lived in a culture of individualistic self-promotion. Thus they found it natural to fit their Christianity to their cultural mold. In his letter, Paul seeks to instruct his church so that their behavior might flow from a right understanding of Christian theology. Rather than simply shouting, “Don’t be individualistic,” Paul helps the Corinthians to comprehend who they are as a community formed by God. He does this by using the image of the human body. This would have been a familiar analogy to the recipients of Paul’s letter, since many in the Roman world besides Paul used the image of the body as a way to talk about human relationships and institutions. But, as we’ll see, some of Paul’s emphases would have come as quite a surprise. For just as the body is one and has many members, and all the members of the body, though many, are one body, so it is with Christ. For in the one Spirit we were all baptized into one body—Jews or Greeks, slaves or free—and we were all made to drink of one Spirit. (1 Cor 12:12-13). According to Paul, we have all been baptized into Christ’s body by one Spirit (1 Cor 12:12). The Greek verb translated as “to baptize” literally means “to dip” or “to immerse” something in a liquid. It’s a little hard to envision something being immersed in a solid physical body. In fact, the “dipped into a body” image is what we call a mixed metaphor. It wouldn’t get a high grade in a high school writing assignment, but it does draw attention to the fact that individual believers are joined in some profound way to a body. If Paul had been writing his letter in the 1960s rather than the 50s, he might have been tempted to speak of the beginning of discipleship as Christian fondue. If you’re as old as I am, you may remember the fondue craze that his the U.S. in the 60s. 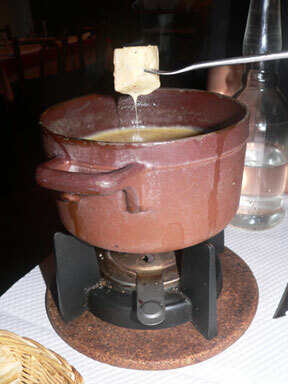 Throughout America people were imitated the Swiss by dipping bread into hot pots of cheese, and topping it off with fruit dipped into steaming chocolate. Paul might have said that when we put our faith in Christ, we are dipped into the Spirit much like a piece of bread into a Fondue pot of cheese. But this metaphor wouldn’t have been quite right, because Christians remain immersed in the Spirit, unlike the pieces of bread that, once saturated, are eaten by eager Fonduers. Paul, of course, didn’t have available to him an image from our day that makes the point a little more elegantly. If he were writing in 2008 AD rather than 50 AD, Paul might say, “by the surgery of the Spirit, we have all been transplanted into Christ’s body as vital organs.” In since he was writing two millennia earlier, Paul uses the language of immersion to make sure that we don’t consider our connection to the body as something extrinsic and temporary. We belong permanently and essentially. Our immersion within the body happens by the work of the Holy Spirit in the moment of our conversion. The theological fact of our connection to the body depends upon God’s action, not upon our own. Whether we choose to live in light of what God has done is up to us, however. Yet if you are a vital organ that has been transplanted into Christ’s body, you can see how counterproductive it would be for you to live apart from that body. Positively, both the body of Christ and your own life would be strengthened through your connection to the body, but weakened by your disconnection from it. Finally, notice that Paul clearly states that “we have all been baptized into Christ’s body.” Nobody escapes this immersion by the Spirit. No one can rightly claim to be a Christian who has somehow avoided this work of the Holy Spirit. Those who always plays hooky from church to commune alone with God have simply chosen to live as amputated body parts, no matter how much this might impair their own spiritual health, not to mention the health of the church that is deprived of their participation. It was good to meet you earlier this week. About fondue and the 1960’s — I’m guessing they don’t have these restaurants in your part of Texas?